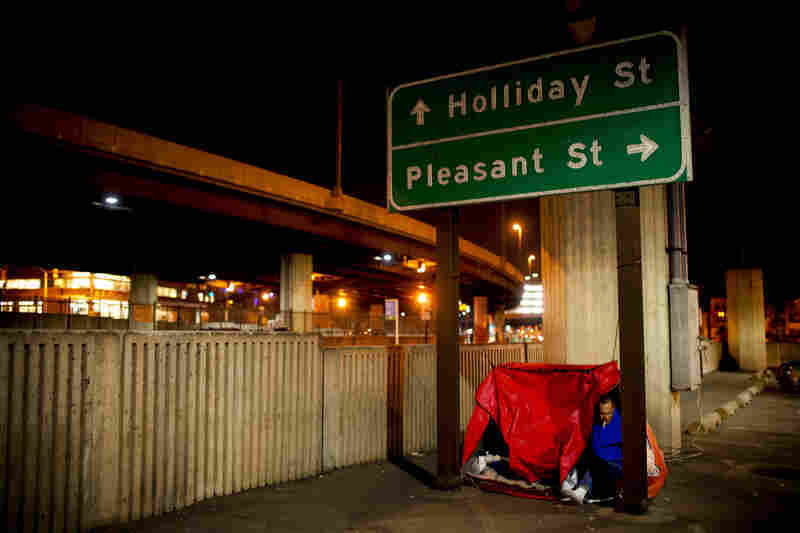 Health Problems Compound For Aging Homeless Tony Lithgow and Andrea Mayer live under a highway overpass in Baltimore. They're among a growing number of the nation's homeless who are reaching what's called "premature old age." They're in their late 40s and 50s, but suffer from ailments more common for those in their 70s. 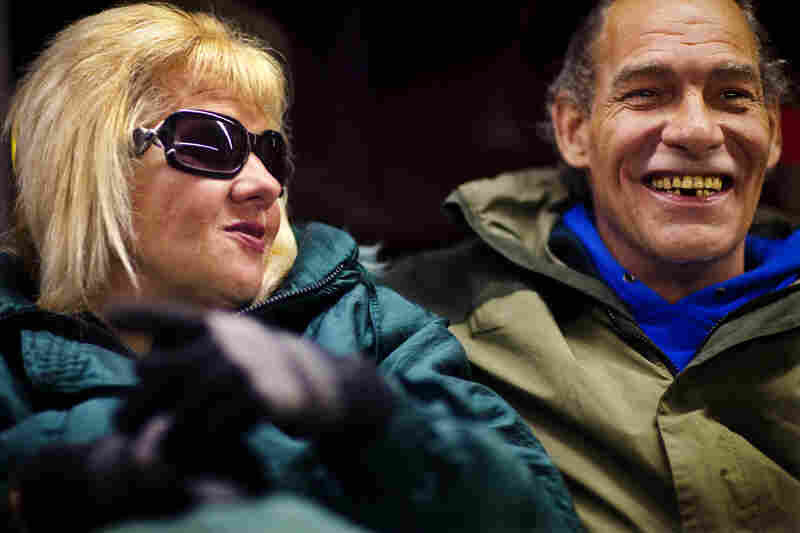 Tony Lithgow, 49, and Andrea Mayer (right), 51, live together on the streets of Baltimore. They are part of a growing number of the nation's homeless who are reaching "premature old age." While in line at the United Church of Christ soup kitchen, Tony passes Andrea a bag full of her prescription medications. Before being homeless, Andrea suffered from a host of ailments that have only gotten worse, and now she needs both knees replaced. "I'm living on painkillers," she says. Tony suffers from a bulging disc that is aggravated by the 75 pounds of the couple's clothing, toiletries, important documents and medications he carries on his back every day. Andrea and Tony sit down to eat a meal consisting of white beans, mashed potatoes, hot dogs and a roll. It's challenging to eat healthy when you are on the streets, often relying on free meals. Tony and Andrea admit that poor decisions and bad circumstances led them from a middle-class life to living on the streets. "You're a paycheck away" from being homeless, Tony says. After dinner, they walk to a bus stop to catch a free bus to a parking lot where they sleep. On the bus they often recognize other homeless people taking advantage of the free, heated ride to keep out of the cold. "I think we see more older people," Andrea says of the overall homeless population, "and I've never seen — and I've been in three different states — never seen so many mentally ill."
Tony says he'd like to go back to work but doesn't want to leave Andrea on the streets alone. They might be able to afford a small efficiency apartment with Andrea's Social Security disability payments but can't gather the security deposit. Every night the couple sleeps in a makeshift tent under a highway near downtown. They say shelters aren't an option because they would get separated and the facilities aren't safe. Tony plugs a small heater into an outlet in the parking lot. "We're sort of living high class compared to what these people are living," says Andrea, referring to the dozens of others sleeping nearby. "We're warm at night. These people are freezing to death." Tony Lithgow and Andrea Mayer have been living under a highway overpass in downtown Baltimore since last year. He's 49 and has been homeless on and off for eight years. She's 51 and has been homeless for 10 years. Living on the streets has clearly taken a toll on the couple, both physically and mentally. While they're standing at a corner waiting for a free city bus to take them to a soup kitchen, Tony shouts at a passenger staring at them from a car stopped at the light. "We're homeless!" he calls out to the man. Andrea tries to get him to stop, but Tony is on a roll. His anger is palpable. "You're one paycheck away," he says. "That's all they are. And they don't understand. That's all it was for us." 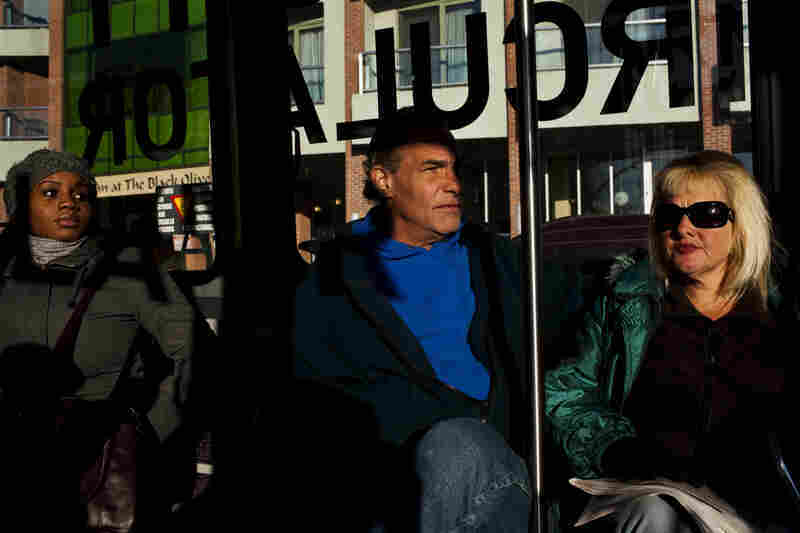 A growing number of the nation's homeless are reaching what's called "premature old age." Like Tony and Andrea, they're in their late 40s and 50s, but suffer from ailments more common for those in their 70s. Many will likely die over the next decade. This has posed a challenge for communities trying to care for the homeless and could mean hundreds of millions of dollars in added costs, especially for health care. Tony and Andrea say bad circumstances and bad decisions sent them spiraling from their middle-class lives and onto the streets. "My husband died. I screwed up and I blew all the money," Andrea says. She adds that she was also very sick at the time and couldn't work. She suffered from Lyme disease, high blood pressure, memory loss and osteoarthritis. Tony took care of his mother until she died of multiple sclerosis, and that cost him all of his savings. He says he worked as a cook and locksmith, but when the economy soured, he couldn't get a job. 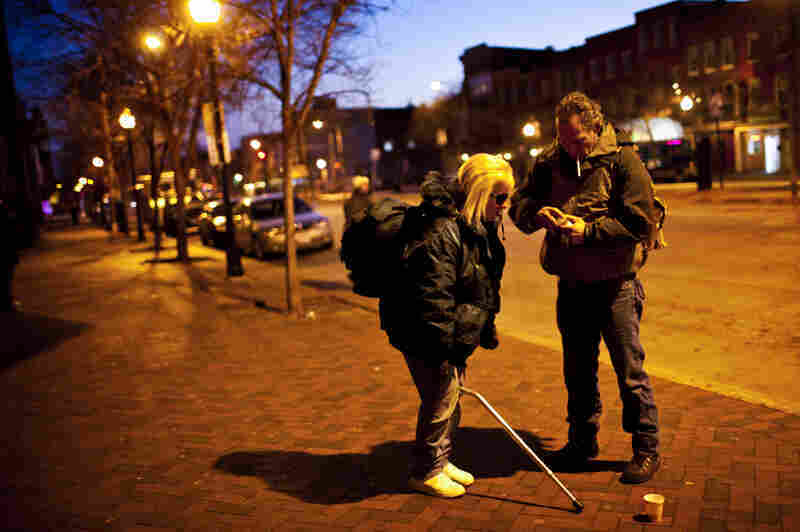 Tony Lithgow, 49, and Andrea Mayer, 51, live together on the streets of Baltimore. Researchers say the aging homeless population is due to younger baby boomers who came of age during the 1970s and '80s, when there were back-to-back recessions. Now they're homeless. Andrea's physical problems have only gotten worse and Tony has a bulging disc. You can see the pain on his face when he hikes a huge duffel bag onto his back. He carries all their essentials — 75 pounds of clothing, toiletries, important documents and medication. This includes a dozen pill bottles, mostly for Andrea. She's also in constant pain and needs to have both of her knees replaced. She walks with a cane she received from another homeless person, after hers was stolen. "I don't feel safe without it," she says. "Because my knees buckle, you know ... by the end of the day, I'm in excruciating pain. Right now, I'm living on painkillers." It might seem unusual for someone who's 51, like Andrea, to be so infirm. But it's extremely common if you're homeless: For those living out on the streets, 50 is old. "It ages you prematurely," says Nilesh Kalyanaraman, chief medical officer at Health Care for the Homeless, a clinic in Baltimore. Like similar clinics across the country, the Baltimore facility is seeing a growing number of older patients as the baby boom generation ages. Kalyanaraman says people's health problems only snowball the longer they're outside, which makes treatment more difficult and expensive. "If you're on the street, you're about three times more likely to have hypertension or cardiovascular disease. You're about 50 percent more likely to die from it as well," he says. 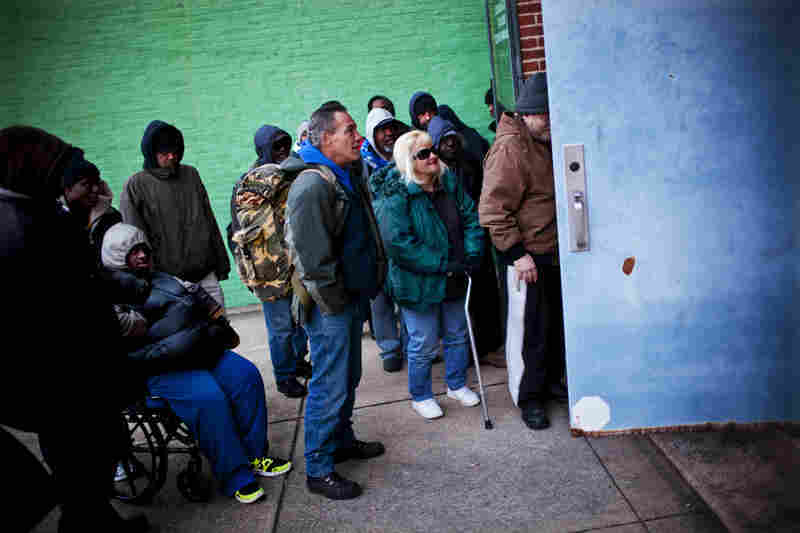 "Diabetes is more prevalent if you're homeless. It's harder to control." Kalyanaraman says it's especially difficult to have a healthy diet when you're homeless. When Andrea and Tony go to the United Church of Christ soup kitchen for dinner, the meal is heavy on the starch — white beans, mashed potatoes with cut-up hot dogs, white hamburger rolls and a pastry. Tony whispers to Andrea that the beans look a little scary. But they have little choice and know the people here mean well. They finish eating in about 15 minutes and tell the servers that they'll see them again next week. Tony is frustrated. He says he'd like to get a job, but doesn't want to leave Andrea alone outside. It's too dangerous. Andrea was punched in the face when they were robbed recently at a bus stop. Tony thinks they could afford a small efficiency apartment — using Andrea's Social Security disability payments — but he says they don't have enough money for a security deposit. Nobody's helping us. I'm tired. I'm tired. I'm exhausted. This is not a joke anymore. I hurt. "I got to get her off the street and I can't do it. Nobody's helping us. I'm tired. I'm tired. I'm exhausted," he says as his voice cracks. "This is not a joke anymore. I hurt." Tony stands up. Andrea watches him walk away with a concerned expression on his face. "I've never seen this, seen him so emotional," she says. 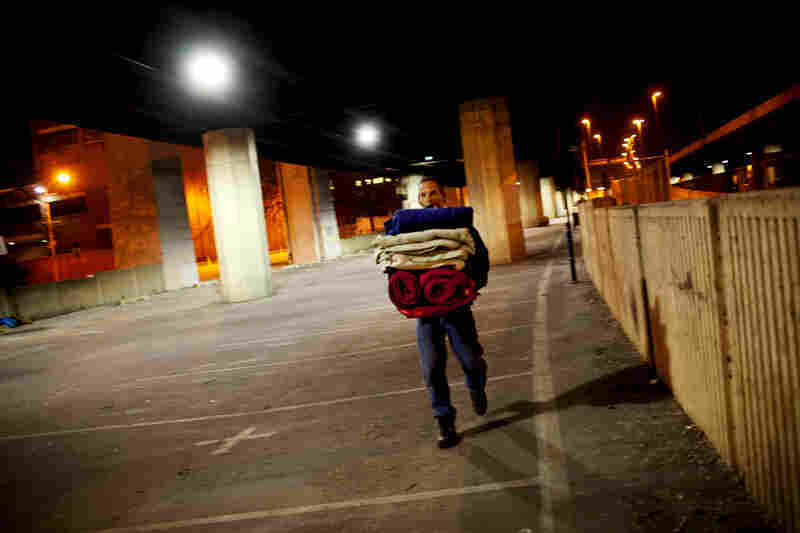 On any given night, more than 600,000 people are homeless in the U.S. By some estimates about a third are 47 or older — almost half the single adults. And this group is growing. Researchers say that's partly due to younger baby boomers who are more likely than others to be homeless. They came of age in the late '70s and '80s, when the economy was especially bad, there was a crack cocaine epidemic and some of them never quite got on track. 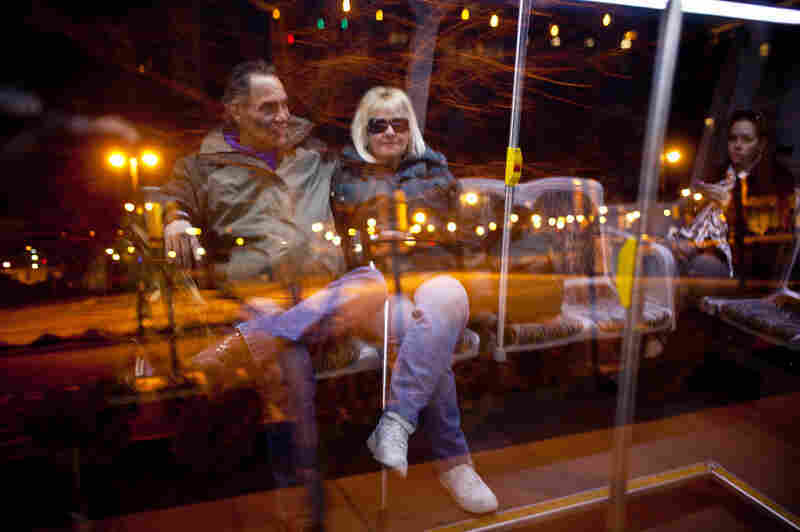 After dinner, Andrea and Tony take another bus back to a small parking lot downtown under the interstate highway. This is where they sleep, as thousands of cars pass overhead. Their blankets, sleeping bags and everything else they own are hidden away — at least that's what they hope. "You know, we never know if we're going to be OK until we check the stuff. And it's usually the homeless ripping off the homeless," Andrea says. Someone stole all their things — including her dentures — last fall, when Andrea had to be rushed to the hospital for emergency gallbladder surgery. She still has no teeth. Baltimore and other cities are trying to get the homeless off the streets and into permanent supportive housing. But money is scarce and they've only scratched the surface. Like other couples, Andrea and Tony prefer to sleep outside rather than in a city shelter, where they'd be separated. And in the parking lot, they've found an electric outlet to charge their phones and plug in a small heater. "I mean, we're sort of living high class compared to what these people are living," says Andrea, referring to the dozens of others sleeping nearby on city streets. "We're warm at night. These people are freezing to death." Exhausted, Andrea sits down on a bag and watches Tony proceed with their nightly routine. He takes some rope and attaches solar blankets to a street sign to form a makeshift tent. He then covers the ground with layers of blankets and sleeping bags. "See, what I do is I put the heater in first. I turn it on and it gets nice and warm in here, while I'm putting it together," he says. And the tent is pretty cozy inside by the time Tony is finished. Still, he says, this is no way to live. When Andrea was released from the hospital after her surgery, this is where she came to recuperate and where he changed her dressings.